With space for eight passengers, the 2018 Honda Odyssey offers more than 4,000 litres of cargo space behind the front seats and 929 litres with all seats in place. 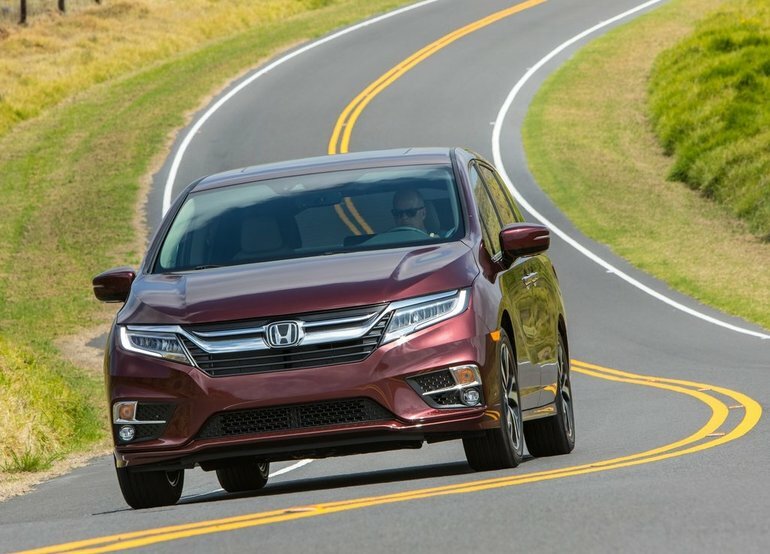 The 2018 Honda Odyssey has just entered the market and has already garnered impressive reviews from the specialized press. The Odyssey has always stood out in its segment, but this new-generation model has more up its sleeve while retaining the traits that dictated its success so far. Starting from $34,890, the new 2018 Honda Odyssey is powered by a 3.5-litre V6 engine with 280 horsepower and 262 lb.-ft. of torque. This engine is paired with a 9-speed automatic transmission in most versions of the Honda minivan, but the buyer can also get a 10-speed gearbox in the Touring version. It is possible to modify how the Odyssey operates in the snow using the Snow mode or to improve fuel consumption using the ECON mode. The towing capacity is set at 1,360 kg. With space for eight passengers, the 2018 Honda Odyssey offers more than 4,000 litres of cargo space behind the front seats and 929 litres with all seats in place. There are six versions of the 2018 Honda Odyssey, and they all offer a multi-angle rearview camera, dual zone climate control, keyless entry with push button start, heated front seats, a Magic Slide system for the second row of seats, Apple CarPlay and Android Auto connectivity technologies, and Wi-Fi access. Best of all, the 2018 Honda Odyssey features the full range of Honda's driver assistance features, which includes automatic braking and collision prevention system, forward collision warning system, lane departure warning and prevention, and adaptive cruise control. There are also airbags everywhere, including for your knees. Leather seats, a navigation system, a vacuum cleaner, three-zone air conditioning, ventilated seats, wireless charging for your mobile device, and a rear DVD player system are just some of the extra equipment that we find in the different versions of the new Odyssey. On the road, the 2018 Honda Odyssey will impress you with its comfort and refinement, but also with how quiet the cabin is. This is truly the perfect vehicle for long family road trips. It is safe, reliable, efficient, fun to drive, packed with features, and incredibly spacious. For more information, contact us today at Halton Honda!